Main Objective: Removing items unrelated to the bedroom and creating a peaceful place to rest and start your day. The Details: We were thrilled to work with a brilliant entrepreneur throughout his charming Duboce Park one bedroom apartment. Today we showcase the first of his three redesigned rooms: the bedroom. Our client, who we will refer to as C, was very ready to take control of his belongings. His motivation for working with us was threefold. An entrepreneur who frequently works from home, having a harmonious and organized space was of the utmost importance. As a frequent traveler it was also crucial for him to be able to pack up and head out for a variety of international destinations with ease. And finally, while traveling, C oftens offsets his expenses by renting out his apartment on Airbnb. Clutter free rooms with an elevated design sense not only garner higher rents but also make the transition between C and his guests seamless. Main Objective: To create a personal retreat from roommate living, and reveal our client's style which was hidden in a mish-mash of accessories. The Details: Kira is an active, on-the-go San Francisco resident. As lovely as she is brilliant, Kira's time is full of concerts, camping trips, and potlucks with friends -- leaving little time to do a deep clean of her space or thoughtfully arrange her belongings. Serving as more of a launching pad to her greater social life than an actual bedroom, her space had become cluttered with weekend bags and changes of clothes. 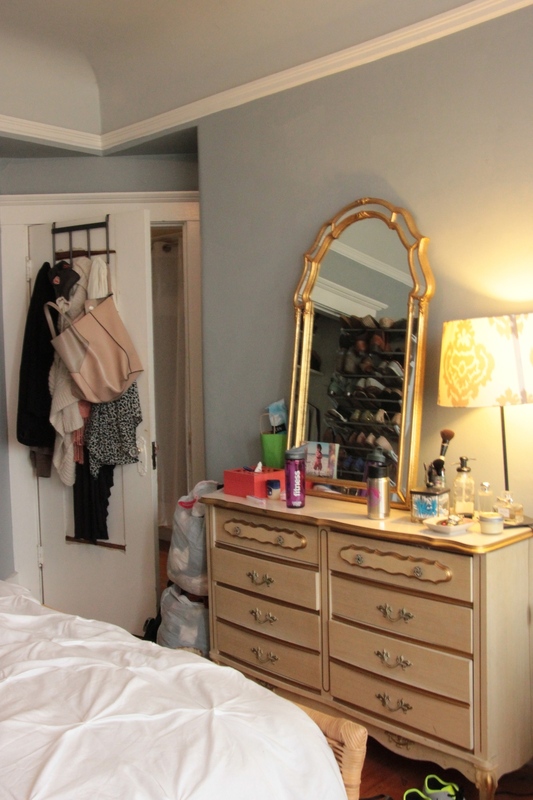 Before: Always on the go, Kira's belongings and furniture were haphazardly placed in her bedroom, creating a sense of chaos and discord rather than relaxation or intimacy. Even after a few years of living in the space, it did not feel like home. Our design challenge was to make the space cozy and inviting; a place where Kira could relax and read when taking a time out from her busy schedule. Redesign Tip: Sometimes we ask too much of our rooms. We want our bedroom to function as an office, living room and bedroom. But the fact is, a bedroom is a bedroom and more often than not the bed should be the focal point. Simply rearranging the layout was hugely impactful with this redesign. A common mistake is to push the bed in the corner of the room, as Kira had, with the misconception that this will result in more space. After: The bed serves as the focal point of the bedroom, inviting Kira to pause, relax, and rest in her space. Kira’s bedroom presented some interesting challenges. A typically “hacked” bedroom located in a San Francisco Edwardian, the space receives little natural night. Additionally, one wall is dominated by green-tinted soundproofing which covers the sliding double doors leading to another bedroom. We placed the dresser in front of the green soundproofing wall and added the mirror. This turned the soundproofing into a backdrop for Kira’s cherished photos and art. We moved the rustic shelving to the wall opposite the bed to let in more natural light, as well as provide a place for keys and such to live. Before: The green double doors draw unwanted attention to the makeshift status of this former living room. After: By setting the dresser within the door frame, the green doors and molding take on a feeling of an intentional accent wall and architectural framing element. Decluttering Tip: Clutter is often the result of things not have a "home." When an item doesn't have a place where it belongs, a place where it you can always find it and put it away, then it's easy for it to end up on the ground or in the corner. Take time when you move somewhere new to create homes for all of your most important items. Hint: if it's not important enough to have a home, it's not important enough to own! Kira had stashed away an amazing rug that she loved dearly but didn’t know where to put it. Our solution? We hung it from the wall to create a faux headboard and add a much-needed pop of color to the wall. After: A gorgeous rug previous rolled up and collecting dust under the bed serves as a gorgeous focal point, tying together the style of the entire space. This redesign was especially stunning because it had some unexpected results. First, the colors from the hanging rug pulled together all the accessories in the room. It also made the cream-colored walls look intentionally warm, and cozy, rather than drab and dingy. Second, Kira had insisted that she did not have a defined sense of style. But after helping Kira curate her goods down to the most-loved and meaningful, it became clear that all of Kira’s belongings shared a common look and feel, one we would describe as a warm, rustic Bohemian. Below are a few more before + after sets -- they're too lovely not to share!